In September 1933, just a few months after Adolf Hitler came to power, the Austrian writer Leo Perutz published Saint Peter’s Snow, a remarkable novel about an outlandish pharmacological plot to send Germany back into the Middle Ages. A reactionary nobleman, the Baron von Malchin, has discovered that all outbreaks of religious frenzy during the Middle Agesflagellations, witch hunts, crusades, and the likewere preceded by the consumption of bread infected with a fungus known as Saint Peter’s snow. This connection allows Malchin to explain, once and for all, the disappearance of Christianity. Since the intensity of faith depended on fungal infestations, religion was doomed by the arrival of modern agricultural methods. Secularization was the regrettable effect of industrial fertilizers. But Malchin has a plan to turn history around. Chemistry, the very science that destroyed faith, will resurrect it. Hired chemists will extract and refine the psychoactive alkaloids of the fungus and administer them to the unsuspecting peasants living in the village near Malchin’s estate. To make certain that the spiritually mobilized masses act appropriately, Malchin has located a direct descendant of legendary medieval emperor Frederick II (1194–1250) to rule over them. Eventually the whole of Germany will return to the pharmacologically resuscitated Middle Ages and rally behind a charismatic leader. And so Malchin proceeds to hand out the faith drug to his peasants, but thenwell, you will have to read Perutz’s novel (available in Eric Mosbacher’s fine translation from Arcade) to know what happens. Saint Peter’s Snow is one of the few novels that deserve the overused epithet prophetic. Anticipating the complex conspiracy tales that would start to flood shelves in the 1980s, Perutz undertook a lot of research to arrive at a semicredible mixture of arcane historical tidbits and esoteric scientific explanations. 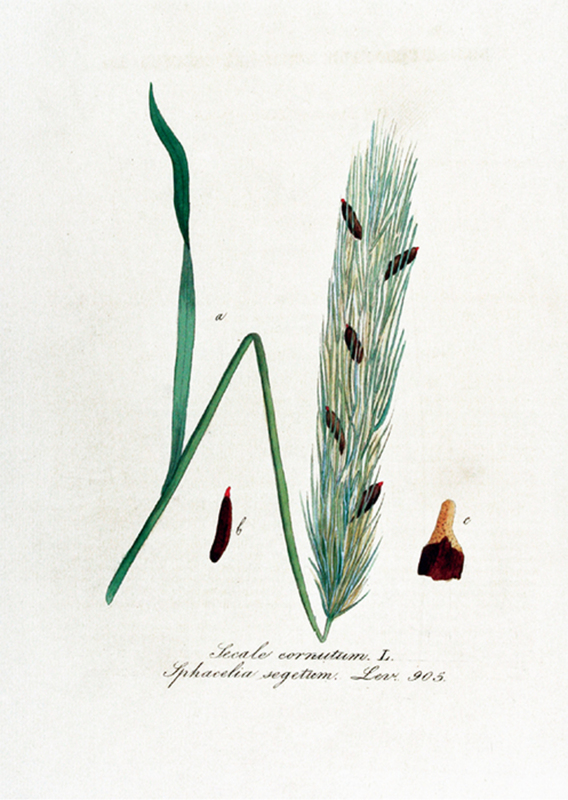 The basic facts are clear: “Saint Peter’s snow” is an obscure regional name for what is commonly known as ergot; ergot is a fungal disease of cereal grasses, especially rye; and consumption of ergot-infested bread can cause ergotism, the symptoms of which include phantasms, delusions, and hallucinationsthat is, all the psychic convulsions that religions thrive on. Indeed, over the past decades, scholars such as Mary K. Matossian have argued in earnest what Perutz presented as fiction: that bygone outbreaks of religious frenzy, including the Salem witch hunt of 1692, were caused by ergot. But then, periodically, there are attempts to take the metaphors literally and to address the real drug abuse in the Third Reich. Like Nazi occultism, this is a slippery subject sandwiched between serious historiography and the sensationalism of garish documentaries. It appears and disappears, and sometimes it disappears long enough to be hailed as something new when it reemerges. The latest installment is Norman Ohler’s Blitzed: Drugs in the Third Reich (Houghton Mifflin Harcourt, 2017; originally published in German in 2015), an immensely readable account of the widespread use of the methamphetamine Pervitin and of Hitler’s drug habits in particular. The Pervitin story is not new, but it has never been better told. Above all, it has never been delivered with such metaphoric excess. Blitzed itself drugs readers with its constant shuffling between the kinetic and the pharmacological meaning of speed. Rarely has a brain been so compulsively whipped into overdrive by methamphetamine as this text by its speed-based metaphors. The basic facts have been known for decades. Methamphetamine was synthesized by Japanese scientists at the end of the nineteenth century and then again in the wake of World War I. It comes as no surprise that, given their stellar track record in the hard-drug domain (morphine, cocaine, heroin, methadone, and many other substances), German chemists soon took over and excelled at breaking bad. Inspired in part by the (then still legal) use of Benzedrine at the 1936 Olympics, Fritz Hauschild, head chemist of the Temmler Works in Berlin, patented a new method of synthesizing methamphetamine. His company, Ohler notes, “was convinced that a performance-enhancing substance was a perfect fit for an age in which everyone was talking about new beginnings.” In 1938, Temmler began selling their nicely wrapped crystal meth as a nonprescription drug under the brand name Pervitin (think “for life,” not “perverse”). Like many other high-profile pharmacological accomplishments that ended up as banned substances, Pervitin started its career as a multipurpose drug in search of a fitting disease, only to be used by many for whom the drug itself became the disease. Among the targeted client groups was housewives. Boxed chocolates laced with generous loads of methamphetamine were said to alleviate “housewife’s depression.” (The term was a euphemism for frigidity, among other things.) It did not take long for Pervitin to be discovered by the usual suspects: shift workers, students pulling all-nighters, and physicians awash in free samples. Here, it is necessary to debunk sensationalist myths. The Third Reich was not a narco-regime. The party did not push speed. On the contrary, Nazi authoritiesled by Reich health führerLeonardo Conti, a former physician for injured brownshirt brawlers, who had risen to the top after his main competitors had been either killed or maimed in hunting accidentsstrove hard to restrict Pervitin by turning it into a prescription drug and then subjecting it to the stringent Reich Opium Law. This was as much a public-health issue as a matter of racial hygiene, though the Third Reich hardly distinguished between the two. After all, Nazi ideology decreed that bodies were vessels of racial maintenance and procreation, hence they were property of the Volk. To abuse them by taking drugs was as much a crime against race and state as that committed by women who polluted their bodies by having sexual relations with members of inferior races. In realityand we need to dwell on this pointPervitin consumption was very much a case of drug abuse from below. Everyday Germans knew a good thing when they tasted it. Ohler is right to point out that there was a general atmospheric incentive hinted at in the book’s original German title, Der totale Rausch. Rausch normally translates as “inebriation,” “intoxication,” or even “ecstasy,” but it is tempting to resort to its most sophomoric cognate: For those not to be found on the regime’s long list of enemies, life in the Third Reich wasmetaphorically and literallya total rush. Like its Stalinist counterpart located to the east, not to mention Italian Fascism, with its Futurist heritage, the Third Reich emphasized speed, acceleration, and Leistung (performance and achievement). The National Socialist German Workers’ Party saw itself not as representing a mere section of the populace but as a movement embodying the German people as a whole; indeed, at its core, the propaganda aimed at removing the indefinite article before movement: Nazism is movementmobilized, euphoric, and aggressive. As Götz Aly claims in Hitler’s Beneficiaries (2006), “For most young Germans, National Socialism did not mean dictatorship, censorship, and repression; it meant freedom and adventure. They saw Nazism as a natural extension of the youth movement, as an anti-aging regimen for body and mind.” As Ohler notes, everyday Germans responded to this alluring accelerationism by seeking out performance-enhancing substances, in this case alluringly marketed crystal meth: “Pervitin became a symptom of the developing performance society.” Use of the drug, then, was both an escape from and an acceptance of the regime’s expectations. To say yes to drugs was to say both yes and no to the regime. Ultimately, though, the National Socialists put their hyperkinetic drones to destructive use; the German people and their führer ended, to paraphrase two of the most memorable drug songs, with tombstones in their eyes in an empire of dirt. This ambivalence lurking within ordinary Germans’ motivations for taking Pervitin and other drugs before and during the war places seemingly outlier studies like Blitzed squarely in line with many recent analyses of the everyday reality of Nazism. Much as we like to think otherwise, the Third Reich was not a top-down dictatorship; its daily life did not resemble the goose-stepping rallies of a Leni Riefenstahl documentary. Most Germans were neither fanatical followers nor dissidents cowering in terror. Knowing what the regime wanted, they manipulated it from below. They supported it but not necessarily in the proper, officially decreed spirit. You might, for instance, have reported a neighbor to the Gestapo for listening to the BBC not because you were a Nazi but because you had a personal grievance. In other words, everyday life in the Reich covered a wide behavioral spectrum: from fanaticism, loyalty, and consent to accommodation, indifference, and silent antipathy to active resistance. Obviously, the regime would have preferred that everybody be a fanatical follower, butand this is the crucial pointit was still able to thrive and prosper so long as the vast majority of attitudes fell short of resistance.Yet it is difficult for us to abandon the Riefenstahl imagery, because we are pushed into it from many sides. The Nazi propaganda apparatus was interested in projecting the image of united Volk idealistically following the führer. Germany’s enemies, in turn, were interested in propagating a similar image in order to mobilize resources against the Third Reich. The most persistent myths about the Reich are those that were bred both inside and outside Germany, albeit for very different reasons. And maybe we cling to these myths because a more nuanced view tends to narrow the distance between the everyday realities and attitudes of dictatorships and democracies. For all its tawdry sensationalism, then, the strange case of Pervitin sheds light on a core dynamic of the Third Reich. However, Blitzed and many of the texts on which it draws have been criticized for exaggerating the actual importance of Pervitin in Hitler’s Germany. The objection no doubt is justified, which is precisely why it makes us overlook the more interesting and timely message. (Local gaffes often hide global insights.) Let us exaggerate the exaggerations to get to the pointthe possibility that the tawdry scenario of Nazis on speed reveals the hidden truth that modern history is governed by a pharmacological a priori. What is the twentieth century other than a sequence of pharmaco-ideological regimes in which people below actively seek out the uppers and downers that best correspond to demands from above? The altered state of consciousness promised by LSD in the ’60s mirrors the altered state of society promised by political activism. 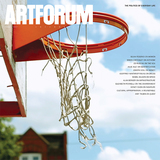 Doesn’t the widespread abuse of Pervitin, the attempt to live up to unrealistic ideals of speed, efficiency, and perfection propagated by the Nazi regime in an effort to “make Germany great again,” resemble the crack binge/epidemic of the go-go Reagan years, with its attempt to satisfy the equally impossible demands of advanced capitalism? Nothing spells American Leistung like a few lines of cocaine. The crystal-meth and oxycodone epidemics of the postindustrial Bush-Obama-Trump years, in turn, resemble the rampant Ambien, Xanax, and Valium addictions acquired in the quelling of postindustrial anxieties. Let the intoxicants fit the times, and if the times resemble one another, recycle the drugs. The politics of everyday life are the politics of everyday drugs. But putting aside the question of to what extent methamphetamines served the ideological and societal needs of the Third Reich, they certainly satisfied the basic demands of war. This is where the German armed forces, or the Wehrmacht, come inand where books like Blitzed gain full metaphoric traction (and cheap documentaries descend into the pulp netherworld of custom-bred Aryan supersoldiers). In order to understand how neatly Pervitin fits into the war narrative, one must grasp the broader German intersection of strategy and geography. Confronted repeatedly over the course of modern history with the looming prospect of a two-front war and the knowledge that Germany lacked the resources to sustain an extended conflict, Prussian and German military planners had to ensure rapid deployments and equally swift victories. From Great Elector Frederick William’s (successful) mad 160-mile march to defeat the Swedes at Fehrbellin (1675) to Helmuth von Moltke the Elder’s (successful) deployment of his armies in the Austro-Prussian War of 1866, and from the (failed) Schlieffen Plan of 1914 to the (failed) Operation Barbarossa of 1941, the premise remained that Germany must wage its campaigns and wars quickly or not at all. Blitzkrieg represented the ultimate response to these constraints. It was, in a nutshell, the operational deployment of a tactical innovation in the face of overriding strategic challenges. To break the trench warfare of World War I, the German army developed storm-trooper tactics with small, independent units breaking through weak points and fanning out behind the enemy. World War II motorized the procedure by replacing infantry with tank brigades and motorized divisions that overran enemy lines to create psychological and logistical havoc in the hinterland. For these operations to succeed, speed and perseverance were of the essence. You not only had to move very fast (Alexander Kluge once spoke of blitzkrieg as the art of escaping from your own side, as in the case of Rommel in France, who sped so far ahead of the rest of the German invasion force that he was out of reach of his superiors), you also had to keep moving at a rapid pace for several days. Inevitably, blitzkrieg runs up against physiological limits: It highlights the old truth that a soldier’s greatest enemy is not another soldier but fatigue. The Wehrmacht’s resident physiologists started to conduct experiments in 1938 only to discover what their students, most of whom soon would be off to war, already knew: When it comes to staying awake, be it over textbooks or in tanks, a methamphetamine like Pervitin beats caffeine, booze, and placebos. It even beats the Allied Forces’ preferred drug of choice, Benzedrine, which, after all, is a mere amphetamine. If speedthe drughad not already existed, it would have been invented by a kind of war whose very name is speed: Blitzkrieg, or “lightning war.” Nazism represents one of the first modern attempts to achieve escape velocity from conventional history, initially with the rush of an accelerated society, then with the rush of accelerated war. But once again, how widespread was Pervitin use? Given that some of the Temmler sales figures are lost, it is impossible to arrive at exact numbers. Various sources claim that German military personnel consumed upward of sixty million tablets during the war, of which thirty-five million alone were handed out during the campaigns in Poland and France. According to one of the more reliable sources, Tilmann Holzer’s 2007 dissertation on the troublesome continuities in German drug policy from 1933 to 1972, in most years civilian use of Pervitin tended to be twice or three times that of the military. But where exactly do we draw the line between the two in a fully mobilized society? Enter inevitable exhibit A, to be found in all Pervitin accounts, the future Nobel Laureate in literature Heinrich Böll. As a young soldier stationed in whatever country the Wehrmacht happened to occupy, he seems to have been unable to write a letter home without asking for more Pervitin. No doubt many of those who were called up brought the drug to the army. As well, the Böll example shows that official attempts to curtail its use on the home front were not very effective. 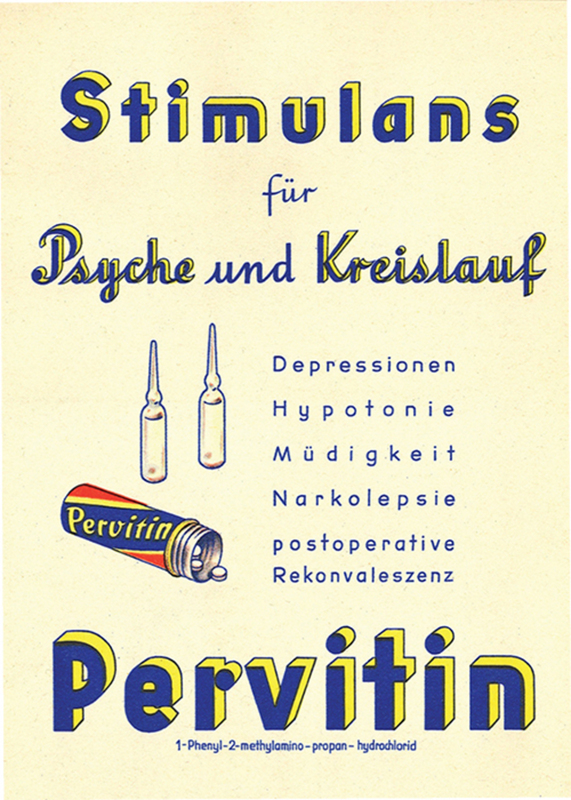 Yet while the Wehrmacht did not care much about civilian legislation, it did adopt guidelines restricting distribution of the drug, whose negative effects soon became evident: Pervitin, at first extremely effective (the author can attest to this from repeated high school experiences), rapidly leads to addiction, physical breakdown, and psychotic delusions. It appears that, following a period of fairly indiscriminate use in the earlier stages of the war, specific orders were issued that medics hand out tablets only in extreme situations. These extreme situations, however (and here the story fully descends into the murderous cynicism in which the Nazi regime specialized), were frequently created by the Germans themselves. Young teenagers called up in the losing days of the war were fed speed before facing off against Red Army tanks; Pervitin was used for suicide missions in miniature-submarine operations that resulted in an overall casualty rate of roughly 90 percent; and, at the behest of the army, concentration-camp inmates had to endure exhaustion experiments to determine the best drug cocktail for frontline soldiers. But for all the damage Pervitin caused (and for all the praise heaped on the drug by combat physiologists), whether the drug played a decisive role in the war remains an open question. All things considered, it is realistic to assume that military history would have been much the same had the product been restricted to housewives. The notion that the Wehrmacht consisted of a mass of crackheads speeding toward Stalingrad is as credible as the view that the majority of US soldiers spent their Vietnam days on acid. It makes for good movies but bad history. In the end, drugs appear to have the same effect on their users that they have on their observers: They bring about a conspicuous divide between perception and reality. 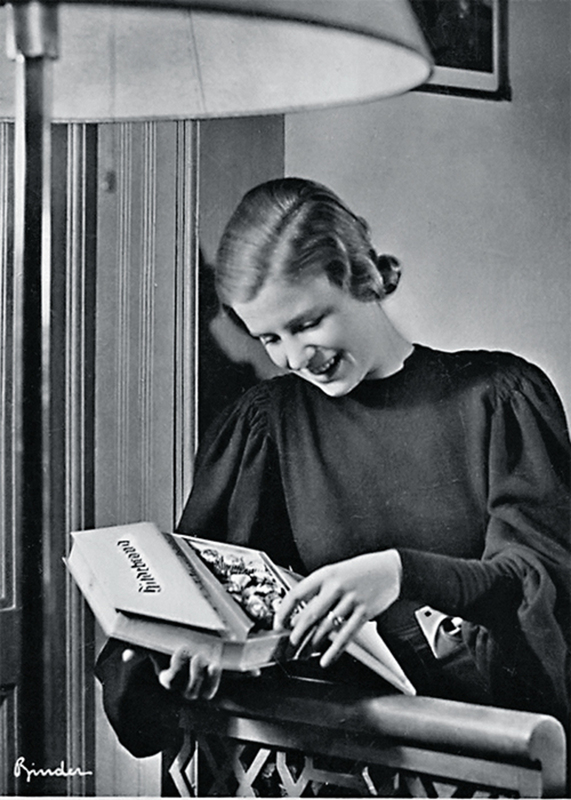 Promotional material for Hildebrand chocolates, which contained methamphetamine, 1938. In many ways, Germany is the quintessential ersatz nation. Deprived of coffee in two world wars, it created radicchio-based substitutes now for sale in overpriced health-food stores. Denied a bona fide political revolution, it staged surrogates in physics, philosophy, and music. Lacking colonies that could be ransacked for exotic plants with marketable pharmacological properties, it excelled at creating artificial replacements. After all, from a chemist’s perspective, the world is marked by the highly uneven distribution of highly desirable molecules, and at no place and time in history was this felt more acutely than in Germany between the middle of the nineteenth and the middle of the twentieth century. As a result, no other country went to such extremes to correct the imbalance. The story of Nazis on speed plays out against the background of two longstanding national challenges: the economic challenge to come up with synthetic replacements for natural substances that Germany lacked, and the military challenge to devise tactical and technological means to compensate for a lack of resources and a strategically disadvantageous middle position. Pervitin responded to both demands. It contributed its share to Germany’s goal of achieving self-sufficiency and increased efficiency, and it provided the speed and stamina once Germany decided to strike out. But above all, like cocaine in the ’80s or Ritalin and Adderall today, it appeared to satisfy the demands of a kinetically obsessed, rushed, and self-enraptured society in which sleeplike lunchis for wimps. And here we are back in Malchin’s territory. The crowning achievement of Perutz’s Saint Peter’s Snow was to focus on a peculiar constellation that Jeffrey Herf fifty years later famously labeled “reactionary modernism.” This is the idea, peddled by thinkers on the Right, that the most advanced, up-to-date technological means can be used to realize the most backward, reactionary social fantasies. For up-to-date reactionaries like Malchin, there is no contradiction between Bibles and Bunsen burners, crucifixes and cathode rays; for many Nazi ideologues, there appear to have been none between V-2 rockets and premodern tribal communities. This points to a core contradiction of Nazi ideology and practice: the use of synthetic, technical, and artificial enhancements to supercharge physical and psychical performance in order to restore a natural state that had been lostand lost, paradoxically, to precisely those forces and developments that were then mobilized to resurrect it. The Nazis started a war in the interest of creating conditions to maintain, secure, and enhance racial purity, but that war was fought with the understanding that this allegedly natural purity was already compromised enough to deserve some decidedly unnatural help cooked up in labs. Life is, after all, a sequence of improbable chemical reactions, so why not add a bit of chemistry to add a bit more life? To enhance a lyric from Wagner’s Parsifal, “Only the chemical spear that smote the wound can heal it.” This is, no doubt, a strange thought, but is it unique to Nazism? Did it not reappear in cultures and countercultures located farther westward? Andmaybe not coincidentallyespecially among those that indulged in increased drug consumption? Geoffrey Winthrop-Young teaches at the University of British Columbia in Vancouver.